This is a guest post by Miquel Torres. Miquel has a degree in Physics from the University of Valencia, he currently lives in Germany and works in secondary education and in the field of energy investment. The main criticism made to my previous post about a paper by the Energy Watch Group, was that it is irrelevant whether current reserves are depleted because of three reasons: new discoveries will be made, increasing reserves, lower grade ores can be used, giving us many thousands of years of reserves at current or increased consumption rates and, at a high enough uranium price, reprocessing and MOX recycle would become economical, greatly increasing reserve life, and even a closed nuclear fuel cycle could be created with breeders, rendering the resource issue entirely moot. Those are fare points, and I will try to address them in this post. Let's make this clear: We will never run out of uranium. The same happens with oil or any other resource. Price determines what portion of a resource base that can be recovered. Beyond that price, it just doesn't make sense economically to extract more of the resource. The next figure shows the possible uranium production curve for all known and inferred reserves with a price lower than 130$/kg. 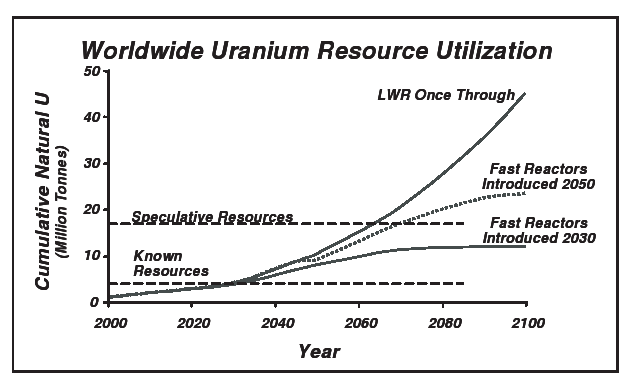 Figure 1: History and forecast of uranium production based on reported resources. The smallest area covers 1,900 kt uranium which have the status of proved reserves while the data uncertainty increases towards the largest area based on 4,700 kt uranium which represents possible reserves. Source: URANIUM RESOURCES AND NUCLEAR ENERGY by the Energy Watch Group. The nuclear industry reminds us that uranium is such tiny portion of nuclear production costs that it can use fuel orders of magnitude more expensive (and orders of magnitude lower grade ores) without driving their total costs up too much. Deffeyes & MacGregor have estimated the distribution of Uranium in different types of rock and show that shales and phosphates contain 8000 times as much Uranium as current Uranium Ore bodies at a concentration of 10 -20 PPM. New plants could produce electricity at a cost of between 3.3 and 4.4 $cent/kWh. I'll use 4c/kWh. I won't discuss what the price would be if the nuclear industry had to take care of insurance costs in the case where liability for nuclear accidents was not internationally limited, and ignore the possibility that any waste disposal costs exceed the amount predicted and included in the costs analysis. I will just accept a price in the 4c/kWh range as accurate (which is similar to France's costs for standardized plants). As of January 2007, at likely uranium (U3O8) contract prices of 53$/kg (usually about a third of current spot price. Note that in April, the uranium spot price is aproaching the 100$/lb mark, which corresponds to more than 200$/kg), total fuel costs are 0.50c/kWh. Of that, only 0.13c/kWh correspond to raw uranium, and the rest comes from conversion, enrichment and fuel fabrication. 0.13c is indeed a small portion of the total 4c/kWh electricity price, about 3.3%. Assuming constant costs for the latter three categories, a 130$/kg uranium price contributes 0.32c/kWh to the electricity production price, rising the total to 3.87c/kWh+0.32c/kWh = 4.19c/kWh at a 7,6% raw fuel share. Still a small share, and it didn't rise the final price much. The conclusion is that nuclear power can consume all uranium reserves until 130$/kg, (the ones represented in Figure 1) sustaining a nearly 3 fold increase in the uranium price and it's electricity won't cost much more. Increasing slightly the uranium price limit, and allowing for new discoveries, it seems safe to assume that maintaining current nuclear capacity until the end of the century shouldn't pose any uranium-availability problems. The next obvious step is to calculate whether it can save us from the combined Global Warming and Peak Oil crisis. Right now it produces 16% of the world's electricity or 5% primary energy use. The Energy Information Administration predicts that world net electricity consumption will more than double by 2030 in the reference case . Even greatly improving efficiency, it is unlikely that total electricity consumption will decrease, because electrified transport (train , plug-in hybrids, etc.) and substitution of other primary energy uses would consume a lot of new electricity. In the doubling case, the nuclear share would be something like 8% by 2030. If it wants to be the main driver of a post carbon world, it needs a much greater percentage. A 10 fold increase would take it to 80% of the world's electricity production, more or less its actual electricity production share in France. (Keep in mind that it still only means a 16% share in primary energy consumed). A 16 fold increase in the uranium extraction rate would have to follow suit. Let's see how much we can increase exploitable reserves. If we consider an uranium price of 1,300$/kg, a 10 fold increase, raw fuel costs are 3.2c/kWh or 45% for a total of 7.1c/kWh. For a 100 fold increase to 13,000$/kg, 32c/kWh, 89% and 35.9c/kWh respectively. The picture has changed radically and we have clearly hit a limit. Nuclear energy has become extremely expensive, more than all of the alternatives. It is not completely isolated from the uranium fuel price, and a high enough price renders it uncompetitive. Where is that price? How much can we expand our reserves by rising the price we are willing to pay for them?. Nuclear energy has as main advantage being much cheaper than alternatives. No one would ever want to build a new generation of nuclear plants if for the same ballpark price you could get solar or geothermal power on demand and avoid nuclear waste problems altogether. To top that, nuclear energy has cost enormous amounts of money to develop, and any clean technology achieving a similar production price will have done so with vastly less R&D funds and will probably have more potential for the future. Some have expressed their belief that to avert the crisis nuclear fission is the only energy form that can be scaled fast enough and that is capable of baseload and would therefor be willing to pay any price for it. Well, I hope to put those fears to rest. At any price there are alternatives. To name two examples: when considering a the small UK region, wind power is capable of baseload to a 20%+ degree. Commercial parabolic trough solar power plants with thermal storage are being built as of now that provide constant electricity supply even on cloudy days and in the night. So what is the cost of other alternatives now? Table 1: Levelized costs of electricity production in California. By 2030 (the above EIA timeframe) renewable energy sources will have greatly reduced costs. For example by 2020 a price of 6.7c/kWh in southern Spain and 5c/kWh in desert regions is expected for Parabolic Trough. The TREC initiative by the Club of Rome and others, based on a report by the German Aerospace Center envisions a High Voltage Direct Current (HVDC) grid linking North Africa and Europe with a potential solar energy import cost of 7c/kWh. Figure 2: Possible infrastructure for a sustainable supply of power to EUrope, the Middle East and North Africa (EU-MENA). Source: TREC. They even calculate a lower resulting price than with the current energy mix (Figure 3). Figure 3: Estimated future electricity costs e.g. in Germany by using the energy mix of the year 2000 or the TRANS-CSP Mix with shares of imported clean power. Source: TREC. There are other kinds of solutions, some of which will work and some will not. But the message to take home is that civilisation doesn't end if we decide to phase out nuclear energy. Thus, I conclude that an uranium price of $1,300 causing a 7.1c/kWh total price would be much too expensive. Unfortunately, it is not clear how fast reserves rise with increasing uranium price. The nuclear industry claims a factor greater than one, but increasing the price 3.25 times from 40$/kgU to 130$/kgU only increases RAR+IR reserves 1.72 times, a factor of 0.53 (NEA 2006). Increasing uranium production 16 fold to accommodate a 10 fold increase in nuclear capacity without decreasing the R/P ratio would mean a 30 fold increase in price. For a linear scaling factor of 2, an 8 fold increase in price would be needed. Thus to make meaningful predictions we need to know how big reserves would be in the greater than 130$/kgU region. Another factor is improvements in nuclear technology. In the last decades, the nuclear industry has made great strides in improving the uptime and performance current reactors, but any marginal increase in the energy used from uranium will likely be neutralized by the rise in the extraction costs of uranium surely to occur in a post Peak Oil world. Significant improvements will be needed. reprocessing and new advanced thermal or fast reactor technologies. "Generation IV" nuclear energy systems are an ensemble of nuclear reactor technologies that could be deployed by 2030 and present significant improvements in economics, safety and reliability and sustainability over currently operating reactor technologies. 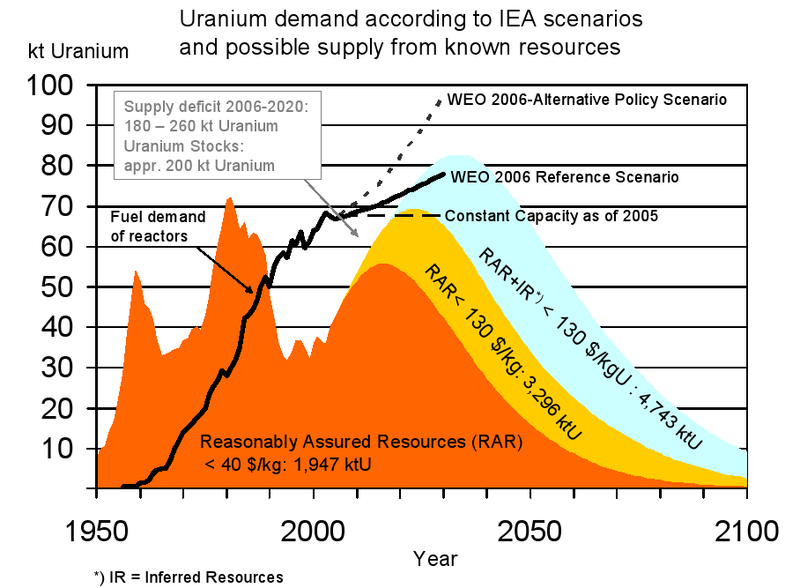 Figure 4: Uranium resource utilization considering three possible scenarios. Source: "A Technology Roadmap for the Generation IV Nuclear Energy Systems", Generation IV International Forum (GIF). Any significant delay in the introduction of breeder technology would result in a limit to the contribution nuclear energy can make to the world's energy supply. Another problem is that making an accurate prediction of the cost per kWh that a fully closed nuclear fuel cycle with fast breeder reactors would have around 2050 is very difficult to make. There are enough Assured, Inferred and Undiscovered Prognosticated uranium resources with a price lower than 130$/kgU for current nuclear energy capacity to be maintained for the whole 21st century. Nuclear energy critics should better drop any such claims to the contrary (this assumes reserves estimations are reliable and 80%+ downgrades don't ever again occur as in the French and USA cases). Claims that include reserves lasting thousands of years while increasing nuclear energy capacity are not true. You would need four figure uranium prices. That is clearly too expensive. A 30% increase in nuclear capacity as projected in EIA's reference case is possible with a moderate increase in the price of uranium causing a mild increase in the price of nuclear electricity. If nuclear energy is to become a major solution to our energy problems, the needed manifold increase in nuclear capacity could make nuclear energy too expensive too be competitive with other alternatives. To properly study last point, NEA must review the whole uranium reserves structure for greater transparency and reliability. At least two new categories must be introduced: 130-500 $/kgU and 500-1000 $/kgU reserves (roughly 4 and 8 times 130$/kgU respectively). The amount of new reserves in this categories will determine the maximum capacity nuclear power for current state-of-the-art Generation III+ reactors may reasonably attain, based on uranium availability alone. Whether that maximum is 1.5 times, twice or even ten times current capacity cannot be determined without knowing how many recoverable reserves there are at different price levels in the 130-1000 $/kgU range. Beyond that maximum, Generation III+ once-through reactors would become uncompetitive, and breeders are needed. Breeders are not expected to be deployable before 2030, and they wouldn't make a significant breeding contribution until decades later. Breeders would thus not be able to significantly contribute to an hypothetical aggressive 5 or 10 fold increase in nuclear capacity over the next 30 years. Last, nuclear power can grow to maintain current production share. Any further growth has to be carefully evaluated for uranium availability, as it could become more expensive than other alternatives.
."Additional recoverable Uranium is estimated to be 35 million tonnes".From Martin Sevior's numbers.
. I will make the assumption that EROEI for the whole nuclear energy system is positive for any given ore grade.
. From Martin Sevior's numbers.
. Nuclear Power in the World Today, World Nuclear Association.
. "What exactly is the share of electricity in France's energy consumption?"
. "Security assessment of future UK electricity scenarios", Tyndall Center.
. Levelized Costs of Electricity Production by Technology. California Energy Commission. , . The DESERTEC concept by the TREC initiative.
. "The Economics of Reprocessing in the United States".
. "A Technology Roadmap for the Generation IV Nuclear Energy Systems", Generation IV International Forum (GIF). Folks, as you can see by looking back over the last two weeks' posts, our reddit and digg totals have declined quite a bit. We hope that you will spend the extra ten seconds to get our contributors' posts more readers if you are so inclined. Mr Torres can you kindly address the extraction of uranium from seawater that was demonstrated in Japan. The total amount of uranium in seawater is 4.5 billion tons though the concentration is very low, 3.3 ppb (3.3mg-U in one ton of seawater). The annual amount of the uranium carried by the Black Current, flowing near Japan, is estimated at 5.2 million tons. When 0.2% of this uranium is collected, it would be enough for all the nuclear power generation in Japan. The cost estimate for recovery is about $120 per pound. 40 Nobukawa 1994: H. Nobukawa "Development of a Floating Type System for Uranium Extraction from Sea Water Using Sea Current and Wave Power," in Proceedings of the 4th International Offshore and Polar Engineering Conference (Osaka, Japan: 10-15 April 1994), pp. 294-300. Using money to make balances is greatly misleading. Economics don't follow underlying phisics very well. Extracting uranium from seawater is indeed feasible, if you have a large amount of cheap fossil energy to spend upon it. But you have to do with EROEI larger than 1 to say BINGO! Same reasoning for nuclear fuel in the main post: using volatile dollar as measure is misleading: suppose a huge recession in USA, rampaging inflation and dollar devaluation, and all our calculation can be thrown away. Again: use EROEI. The phisics rule the game. And more, even a EROEI larger than, say 1.5 could be insufficient, hampered by inefficience in the processing (and economic) chain. fuel, as opposed to e.g. corn-based ethanol. It is a complex inorganic chemistry adsorption tecnnology, and is reusable. It is uranium fishing (dip in seawater, wait, pull out), not distillation. I doubt it will be necessary---there is a current enormous boom in uranium exploration and mine development. I suspect the figures in the original post of uranium reserves available at a given price are highly underestimated. Uranium exploration is not remotely as deep and comprehensive as petroleum exploration. And then, there are fast neutron fuel cycles which let one use the enormous amount of depleted U-238 currently sitting around in dumps. Perhaps there are other non-fossil technologies which in the future will be economical for baseload electricity generation---that's wonderful. I believe that it's important to look not just at the marginal cost (c/kWh) but total capacity availability as well. Nearly all of the geophysically sensitive methods, e.g. wind, solar and geothermal, have strong siting restrictions, in aggregate worse than nuclear plants. This means that there are diseconomies of scale. I believe that maximum effort in both nuclear and non-nuclear sources of non-fossil electricity is imperative. If we go entirely by hypothetical economic computations, the answer comes out to be not stored solar or wind, but cheap coal, which will ALWAYS be cheaper than anything else for 3 centuries, without external regulation. It isn't solar versus nuclear, it's solar & nuclear etc versus coal. I think they made an experiment in which some 1kg of uranium was extracted, and then tried to estimate costs for industry scale extraction. In this estimation, the annual scale of uranium collection was set to 1200 t/y which corresponds to the uranium amount consumed by six nuclear plants. It certainly looks interesting, but attaining a $130/pound price seems optimistic to me. I would reserve judgement until they demonstrate larger scale extraction over a period of time. With the uranium spot price lately going ballistic and fast leaving the $100 mark behind, that price level may be reached in the near future. But before committing to such a project, industry scale feasibility will have to be demonstrated, and people will have to believe that prices will consistently stay above $130 (or whatever the final extraction price will be) for a number of years.
" To name two examples: when considering a the small UK region, wind power is capable of baseload to a 20%+ degree. " Actually what this report states is that 40GW of wind capacity is necessary to displace about 8GW of conventional capacity (20%) due to the wind only blowing 20-40% of the time. Your statement is technically true, that we can replace 20% of UK capacity with wind power, but we will require 5 times the installed capacity of conventional sources. There are further reasons based on security of supply issues why wind is not suitable for base load. The probability of any particular amount of capacity actually being available to the network at any particular moment tends to a normal distribution. For wind power this distibution is considerably wider (and its mean considerably lower per installed MW) than conventional sources. The probablility of the demand also has a normal distribution. Since prices are based on the next maginal MW, i.e. the most expensive producer, the point where these two curves overlap is the point of interest. The less predictable either of these curves are, the greater the fluctuations in price. If a hydro station has to come online to make up the shortfall, everyone has to pay their bid price, so the cost of generating the wind power has little to do with the price to customers simply because it's less predictable. Those of you from California may have heard of a company called Enron which gamed the system (took capacity off-line for "maintenance" etc) so prices rose to the costs of the next most expensive producer. In California this resulted in prices rising tenfold and contributed to the disruptions of supply. We had sinilar problems in the UK when there were too few competitors. This could happen for less malicious reasons with unpredictable power sources such as wind making up significant amounts of the capacity. Just to clear up a slight misunderstanding, when we have to install five times as much wind capacity because the wind isn't blowing all the time in one place, what it means is that to replace a 5 cents a kilowatt nuclear power plant, we have to build five windmills (at the current price of 1 cents a kilowatt) in five locations and hook them up to the power grid in Europe or America in order to get 5 cents a kilowatt power at any time. If you already have installed hydro, you can use windpower to extend the hydro by using wind when the wind is blowing, and hydro when it is not, but your windpower still costs the same 5 cents a kilowatt because the wind is only blowing one fifth of the time. I have run into people who think that since wind is only blowing one fifth of the time, that therefore you have to multiply the cost of wind capacity by five times to get the true cost. You misunderstand my point, it doesn't matter how much it costs any of thoses five wind generators to produce. If the wind resources all happen not to be producing at any one time, which will happen, an expensive producer will have to take up the slack. I gave hydro as an example as hydro is what is used in the UK for peak loads as it can be brought on stream very rapidly. It is still pretty cheap but they can pretty much charge what they like as there's noone else to supply that marginal MW. Customers pay ALL the producers that expensive price, for all the MWs produced regardless of how much it costs them to produce. Windpower is cheap to produce, but unpredictable, in fact the clearing time in the UK trading system was lowered from 3 hours before production to one hour primarily because wind producers couldn't predict accurately enough in that time frame. Compare this to conventional sources which generally trade CFD's months or years in advance of production and you begin to see the problem. Wind, wave and solar power are perfectly adequate for supplying power, but they are most certainly not suitable for a reliable base load. Conflating maximum output and design output (deliberately or not) does not help your credibility. If the wind resources all happen not to be producing at any one time, which will happen, an expensive producer will have to take up the slack. As we are comparing wind and nuclear, the assumption being made is that nuclear is reliable. In fact the BWEA gives a capacity factor of 65%-85% for nuclear power. If you think they're biased, a US industry site claims "Currently, nuclear power plant capacity factors average over 75%", while in the UK the average load factor (actual output/design output) for nuclear is 64.7% (individual plants vary from 34.1% to 83.5%, the newer AGR plants actually average 60.4%), and that is before allowing for planned maintenance downtime. Of course the industry claims future plants will be more reliable and won't suffer cost overruns of 40%. Now consider that the next generation of nuclear plants are designed in the 1000-1600MW range, while commercial wind turbines are in the 500kW - 1MW range. What is the probability that a nuclear plant will have unplanned downtime, compared to simultaneous downtime of the 1500 substitute turbines spread around the country? Unsurprisingly an unreliable power sector that comes in bigger lumps leads to greater fluctuations in output. If the UK builds 10 next-generation plants, assuming an improved load factor of 85% then for more than 80% of the time one or more will be broken (unplanned downtime) and 45% of the time two or more will be broken. How many extra plants at what extra cost will we need to ensure, say, 95% "base load" reliability? Wind, wave and solar power are perfectly adequate for supplying power, but they are most certainly not suitable for a reliable base load. Although more R&D is needed, we know wave and tidal power are much less variable than wind. More independent sources of power leads to greater overall stability, but we still need to improve storage, demand management and inter-regional grid connections to reduce the amount of expensive dispatchable sources needed. With enough stability and demand management, the required dispatchable power could come from biofuels. Studies have shown that the capacity factor of wind is around 35% at it's highest. "The reported annual capacity factor for the UK wind power has varied from 24% to 31%, with a long-term average of around 27% (DUKES, 1998 and DUKES, 2005); these reported figures include downtime due to maintenance, and forced outages due to mechanical failure. In contrast to these reported figures, recent studies (cf. Dale et al., 2004) have tended to use a long-term annual average capacity factor of 35%; this decision is likely based on the higher wind speeds, and hence capacity factors, that are expected from offshore wind power developments, and a bias towards future onshore wind power developments in higher wind speed regions such as Scotland. A pessimistic view of UK capacity factors for wind power has also been put forward by a number of authors, suggesting capacity factor figures of 25% and below (Royal Academy of Engineering, 2003; Sharman, 2005)." Somewhat lower than the 60% lower estimate you gave for nuclear power. In addition you claim that it is unlikely that 1500 turbines will go down at once. In an area the size of the UK it not that unlikely that an unusual large scale weather event could cause a significant portion of the wind power to go off-line. Since the UK is only connected to Europe by 2 2GW busbars (which incidentally both once went out of service despite being an event considered so unlikely no contingency plan existed, demonstrating that unlikely events do occur) it is effectively an isolated region. The main problem with wind, however, is not it's capacity factor but the security of supply. On average the wind will supply a given amount of power to the network but this amount cannot be changed as it is dictated by the wind. For instance, there can be no spinning reserve with wind power, in the event of a frequency drop on the network due to a large plant coming off line, the first port of call for maintaining system stability is for the running plants to increase their output, they're supposed to operate slightly less than their rated capacity to do this (whether they actually do or not is another matter). Hydro which is used for peak demand cannot supply emergency power as for the first few fractions of a second of output they cause further strain on the network, which would result in a further drop in frequency and could cause the other generators to become desynchronised. Following taking up the slack by increasing power to the running generators, the spinning reserve is brought online. These are generators which are spun up but not supplying power to the network. The next step following this is to spin up off-line generators, in order to replace the reserve capacity, this can take minutes to hours depending on the type of plant. How would you suggest any of this is achieved with wind or indeed wave power when you have no clue how much wind or waves will be available at any given time? There is more to the security of the electricity network than just the installed capacity. You are correct in stating that storage could solve some of these problems, but this technology is in its early stages. Further problems with wind are that the best resources bear no particular relation to existing load centres such as cities etc. When you consider that the transmission infrastructure necessary is at least as expensive as the installed capacity this cost can be quite significant. For what it's worth I don't have anything against wind and wave power, I'm just skeptical that they can supply a secure base supply. In fact, as I'm hoping to start a PhD based on optimising various types of marine energy machines next year, I actually have a distinct bias towards this resource! Therefore, as someone who is going to be doing a little bit of the R&D you mention I feel compelled to warn you that we will be stuck with conventional sources for a while to come. You also state the required dispatchable power could come from biofuels. There is considerable debate on this board about the viability of biofuels, I personally don't know enough to comment. Note that wind capacity factor relates average power output to maximum output, while nuclear load factor relates actual power output to design output. No-one (except you?) claims wind turbines are expected to produce maximum power continuously, but that is exactly what design output is meant to be. A better comparison is between nuclear load factor and wind variability. In Alberta (pdf) they calculate they need an excess capacity of 2-7% to cope with variability at moderate (20%) wind penetration. "The emerging consensus in America – from a review of several utility and other studies by the National renewable Energy Laboratory - is that the variability of wind adds very little cost.". In Denmark the standard deviation of wind variability one hour ahead is 3% (the UK will be significantly smaller). The standard deviation of the error in predicting demand in the UK is about 1.3%, so variability over that timescale is comparable to unpredictable demand fluctuations and poses no new problem. Using wind instead of nuclear does not require increasing spinning reserves. Nuclear power certainly cannot provide spinning reserve - start-up times are I believe several hours. It is because of large lumpy unreliable power sources like nuclear that we need spinning reserve in the first place - the spinning reserve is sized to cope with losing the largest lump. As we move away from those sources the need will in fact decrease, not increase. Whenever wind power output exceeds momentary demand, some of the turbines will be feathered or load will be shedded in other ways. These can quickly be brought back on-line if demand increases. Contrary to your claim, there is no reason wind or wave cannot be operated at reduced power levels providing a reserve. Combining wind power with energy storage is sensible and provides additional reserve. I agree more research is needed here. All power sources have varying availability and we need additional installed capacity for reserves. Diversity of supply is good and combining wind, wave, tidal, biomass CHP and other sources, pumped and other storage, regional grids and demand management we can create a reliable system. While nuclear plants are in/near them? The distributed nature of wind and small CHP can actually better match power supply to demand in some regions, but often people don't live in windy places. Offshore wind and wave requires upgrading and extending the electricity grid, this needs investment but is a small proportion of the total energy costs. TREC style electricity interconnects would require upgrading the grid anyway. First of all, I do not recall mentioning nuclear anywhere until you mentioned it. My assertion was simply that wind is not suitable for base load. At all times I have referred to alternatives as conventional sources. "Note that wind capacity factor relates average power output to maximum output, while nuclear load factor relates actual power output to design output. No-one (except you?) claims wind turbines are expected to produce maximum power continuously, but that is exactly what design output is meant to be." So to clarify, a wind capacity factor of 35% means that if you install 100 MW of wind capacity, you will expect to produce, on average 35 MW of power averaged over the period on which the figure is measured. If we scale up the wind farms and spread them out so we have say, 25GW of capacity, we should expect to get a pretty constant 35% into the network from all sources averaged out geographically, i.e. 8.75 GW for 25 GW installed maximum possible capacity, i.e. the possible capacity if the wind was blowing really strong everywhere. Note that the transmission system to achieve this will have to be rated to the maximum capacity otherwise the averaging geographically will not work as congestion will prevent power going where it's needed. With nuclear capacity averaging 64.7% nationwide from your figures, if there were 25 GW of installed nuclear capacity we ought to expect to get, on average, a pretty reliable 16.175 GW of actual input to the grid. I fail to see how these two figures cannot be compared directly. For a given installed productive capacity a certain average power output is achieved. In addition, a wind turbine has a lifetime of approximately half that of a nuclear installation. "While nuclear plants are in/near them?" They may not be right next door, but they're certainly not up to three kilometres off-shore (for near shore) or ten kilometers or more (off-shore) or in hilly or mountainous regions on ridgelines in order to exploit the topographic acceleration where the hill or ridge causes the wind to accelerate as it is forced over it. As for the reserve provided by wind farms. You are correct that a nuclear plant may require up to a day and a half to come on line in some cases, this is not spinning reserve. Spinning reserve are synchronous machines which have been spun up in advance to the synchronous speed of the the grid, but not bearing any actual load. You will find in the document you referred to definitions of the three types of reserve. Wind farms may be able to operate a form a spinning reserve, the amount of which available in any location will be unpredictable more than an hour in advance, but this is not the same as operating under the rated capacity for a conventional plant. In the event of a frequency drop due to a plant outage, I explained the response is to increase the output at generators already connected to the grid and supplying power. This is achieved by increasing the fuel supply to the generator. Since no wind plant can know more that one hour in advance what it's fuel supply will be, how can it provide for this? Nuclear plants most certainly can, and indeed, are obliged to operate less than their rated capacity to allow for this fast-frequency response as it is known. I reiterate my actual point, wind power is fine, but not suitable for base load. edited for many typos! There's probably still plenty there too. And another thing, you also state it is because of large lumpy power stations that we require reserve. As I have already pointed out, one of the worst losses in the UK was the grid interconnect with france, not the loss of a power station. Power losses are more frequently the result of transmission failures as this infrastructure is much more vulnerable to weather, trees falling over etc. The loss of the grid interconnect to a 1500MW wind farm will appear identical to the rest of the grid as the loss of a nuclear power station. Sorry about this, but there is one more thing I noticed when reviewing the paper you cited. The following are the expected errors in the outputs compared to that predicted for given time periods before production. This means this is actually the error in what was produced compared to what was predicted to be produced. So 4 hrs before they had to supply electricity the Danish producers would have been wrong about what they could produce by 10% etc. The problem isn't that you have to build 5 windmills to get 1 nameplate capacity, it's that the production of all 5 will closely correspond. That's what limits penetration, and prevents wind from producing all the power of a grid. To create a reliable wind-only power supply without significant energy storage, you need massive amounts of cross-country infrastructure. Most likely, based on superconducting 'trunk' lines or an expansion of HVDC lines that would give Alcoa wet dreams. The world's largest known uranium deposit was at Olympic Lake in Australia. BHP had plans to produce the deposit over a 60 year mine life. If uranium will reach 500 dollars a pound, someone will invest in a geigercounter and trek across some wilderness area in search of uranium mineralization. Olympic Dam is to get a major expansion to become the world's largest mine of any kind if can it get more water and electrical power. A nuclear power station and desal plant at the coast 300km away would solve this but whaddaya know the nimbies don't like it. That whole geological province has other uranium and thorium reserves and guess who has snapped them up? ..the Chinese. A side effect of this geology is that hot granite at depth could be used to generate steam albeit with minor radon gas. As with potentially dangerous molten salt reservoirs for solar thermal it seems nukular-lite is OK but traditional nuclear isn't. The desal plant is situated at the head of a gulf (Spencer Gulf) which is recognised as an important aquatic nursery for this whole gulf. Mmm. I think you misunderstand the concepts baseload and capacity credit. average load factor of wind. That means that you can actually decommission a conventional plant of the same capacity as the energy produced by the wind mills (20-30% of nominal capacity). That also means no extra costs, intermittency is not an issue. However, as the level of wind penetration rises, the capacity credit begins to tail off. That is why in order to maintain the same level of system security a significant capacity of conventional plant will still be required. So when wind produces a big percentage of a country's electricity, say 20%, the capacity credit it gets is smaller than the energy it produces. That means extra costs arise because backup power plants will have to be kept ready. So at some penetration point it will be uneconomical to continue to expand wind because you would have to keep an entire power plant fleet ready to cover calm periods. The discussion is where that point lies. A worst-case coal backup power plant (capital costs low) that is on standby most of the time and only burns fuel (the expensive and dirty part) on rare occasions is not that bad (most of the time hydro could be enough). "That means extra costs arise because backup power plants will have to be kept ready." Nuclear faces the same issue. Nuclear plants do not run non-stop and at full capacity for their entire life - nothing near it. Toby looked at some of the numbers above. But Plant Maintenance doesn't take every nuclear plant on the eastern seaboard off at the same time for a scheduled quarterly inspection. Whereas a weeklong weather pattern just might. No, not all of the turbines will stop blowing completely... but with the new high efficiency turbines, they produce nearly all their power in a specified range. If a lack of weather events conspire to bring the average windspeed down from 21 mph to 13 mph over a large area... while some mills will keep blowing, you're likely to go from 15-25% of your power generated by wind to 1% of your power generated by wind overnight. The larger and more interconnected your grid, and the more on-demand generation you have, the better prepared for such a weather pattern you are. LOL! The contradiction is nothing short of hilarious. The issue is cost, of course. If breeders or fast reactors do become good enough then there's no point to continue to mine, with its environmental harm, as opposed to recycling and generating new fuel. Would you mind giving some idea of how flexible delivery of Nuclear generated electricity could be. Consider my question as one would of water pouring from a kitchen tap, how off an onny is it? As well how would this flexibility be reflected financially? I'm not miguel but current nuclear reactors do not like to be switched on quickly (i.e. faster than a few hours) and don't respond quickly to daily loads----conventoinal hydroelectric and natural gas are the best for this. This is not very different from coal plants in fact. On the other hand since fuel costs are still very small portions of the cost of running the reactors even 'wasting' nuclear generated power at night is probably not so bad, as opposed to coal (pollution) or gas (cost). If there is serious deployment of electrically recharged vehicles, then electricity demand at night (current low point) may increase disproportionally making baseload generation more desirable. With the time lines you mention of 2030-2050 I think we can make a strong bet on fusion power with plenty of cushion if we decide it can't work. A strong move to get fusion into production by 2030 is doable and we would still have plenty of time to try breeder solutions if needed. On the fission side we simply allow fission to grow at its economically viable rate. So I think that in comparing fusion/fission for long term large scale power fusion does not look that bad assuming we pursue it aggressively now. I see no reason too try to build out a fission solution give your time lines. The seawater extraction uses 350Kg of adsorbent material to to extract 1 kg U in 240 days ... So, you would need just 230 Kg of the polyethylene per Kg of U. The graph above says we need 70,000,000 Kg U just to fuel existing reactors (that’s just 16% of current world electricity). To extract the U required for this year requires 230 x 70,000 tons of polyethylene. That’s around 16.1 million tons. To replace all existing electricity capacity with nuclear would require 100 million tons of polythene. Does anybody know how much polyethylene is manufactured in a year? A report in 1999 said world polyethelene production would reach 50 million metric tons per annum in 2004. Note, the polyethelyne in the uranium adsorption system is not consumed, it is capital investment resusable year over year. My conclusion is that polyethylene capacity is not a major constraint even for an enormous and unrealistic expansion of this currently research-only-method. In the event that mined uranium is sufficiently expensive to make this feasible, I suspect that the profitability would be sufficiently high to permit lots of plastic to be purchased. Also, the method also appears to adsorb other metals which could be quite valuable. So a diversion of 10% of the polyethylene each year, means that in 10 years you have enough. This also assumes that you do not figure out how to do it better. Also, it clearly is a simple process (uranium fishing) and it is proven feasible. The question is only at what price could it be done at in large volume. Even Mr Torres is not saying that the regular supply is going to run out for many decades. This becomes similar to the a super oilsands for peak oil. A very large supply that can be tapped at a price. But this uranium fishing is environmentally more benign and simple than mining the oilsands. Some uranium mines were not productive at below $20/lb uranium oxide, but at $113/lb more capacity will come online. There is quite a lot of new uranium scheduled to come online from central Asia. I think there are other areas that are scheduled for development. It takes time to get projects going. Suppose if this polyethylene-seawater uranium extraction thing works; we should see some production shortly. Yet I do not believe any is scheduled. A considerable source of uranium might come from disarming nuclear missles. With some international treaties to monitor compliance the nuclear arsenals might be cut in half to start with, and then cut in half again, etc. CANDU reactors were safer than nuclear weapons. Supposidely thorium is more common than uranium and it might be used to generate electricity eventually, but the technology is not practical today. I worked on reactors in the 1970's that used Thorium as part of the fuel cycle. Any time you hear people talking about gas cooled reactors in the US Thorium was involved. The last reactor of that kind that I know of was decomissioned in the early 1980s. The Thorium was used with weapons grade Uranium and took the place of the non-fissile U238. The intent at that time was that the Thorium would breed into U235 and be reprocessed into new fuel. That, of course, was never done. I wonder how many recycled plastic bags 100 million tons would be? Also it just occurred to me … is dissolving the waste products from nuclear in seawater at 3ppb a safe disposal method? Sure, but thats pretty wasteful and completely unnecissary. Cancer is a statistical event. You can't prove that it was 'your waste products' that caused it, or disprove it. For the most part (and this isn't 100%, since the body's DNA repair mechanisms are very difficult to grasp in vivo), the chances are proportional to the doses. If your controlled dumping causes one additional cancer death per million people per year, is it "safe"? This brings up the possibility that you will shoulder quite a lot more blame than you deserve for such a disposal scheme. As such, it's ruled by the laws of politics more than the laws of common sense. More favorable from a risk-management perspective would be putting them in rustproof containers resembling torpedos, and letting gravity take them straight down below a few miles of water, and a few hundred feet of silt. You could do this in the open ocean a thousand miles from land, or you could do it at the outer edge of an active sedimentary zone, where the impacts will be swiftly buried and currents have a hard time carrying substances back to the river they came from. Most importantly, they are on noone's property, in no state's jurisdiction, and they cannot physically affect nearby populations until the rivers run backwards(presuming, of course, that you don't use a river that runs backwards). Last week Dr. Bussard is said to have gotten a new contract from the US Navy to work on his next IEC Polywell reactor. While Tom Ligon looks like he will be speaking on behalf of DR Bussard at the 2007 ISDC. I think we'll have an inkling by 2012. If the Polywell fusion idea is for real, it may be that by 2030, here in the US we'll be well on our way to a fusion/solar/wind grid. productive fusion would kill all other forms of electricity generation; there'd be no need except on islands. The "Additional Recoverable Uranium" category certainly has an order of magnitude (and likely to grow in the future) more resources which may be extracted if price is no issue. Of that, Prognosticated Undiscovered Resources <130$/kgU amount to 2,519kt, increasing current reserves of 4,743kt by 65% to a total of 7262kt, or 108 years of current consumption. Inferred Resources (IR) refers to uranium that is inferred to exist based on direct geological evidence, in extensions of well-explored deposits, or in deposits in which geological continuity has been established but where specific data, including measurements of the deposits, and knowledge of the deposit’s characteristics are considered to be inadequate to classify the resource as Reasonably Assured. Prognosticated Resources (PR) are those expected to occur in well-defined geological trends of known deposits. thought to exist in geologically favourable, yet unexplored areas. Note also that the SR are likely to be an underestimate as many countries do not report this category, including Australia, the country with the largest RAR, which shall be hereto referred to as The Motherlode. The nuclear industry claims a factor greater than one, but increasing the price 3.25 times from 40$/kgU to 130$/kgU only increases RAR+IR reserves 1.72 times, a factor of 0.53 (NEA 2006). Increasing uranium production 16 fold to accommodate a 10 fold increase in nuclear capacity without decreasing the R/P ratio would mean a 30 fold increase in price. For a linear scaling factor of 2, an 8 fold increase in price would be needed. The problem with your calculation, Miquel, is that it assumes that all the < $130/kg uranium is in the current RAR+IR and that anything beyond this will cost more. This is simply not he case. Increasing the price from $40/kgU to $130/kgU increases reserves in all categories by 4.35 times. And, as discussed above, this is likely an underestimate because of incomplete SR data. For a start the numbers you quote, while given in Martin Sevoir's article, are not his but come from the Red Book of uranium resources jointly produced by the NEA and the IAEA every two years. That is clear. Sevior's article is mentioned because it was posted on the Oil Drum and uses the numbers of the nuclear industry. I later mention NEA as the source. Your more detailed definition of the reserve categories is correct. You can also find it on page 8 of the report by the Energy Watch Group that I link and based my first post on. IMHO the state of uranium reserves reporting is pretty bad. The categories have changed a few times on different countries. Stated "Reasonable Assured Resources" were severely downgraded in two supposedly reliable countries: the USA and France. If in the most reliable reserve category, numbers can be so downwards revised, what confidence does "Prognosticated Resources" inspire? and "Speculative Resources"?. There are enormous quantities of uranium. The question is at what price is it recoverable. Current NEA reserve numbers do not answer that question, they are nearly useless for that. The problem with your calculation, Miquel, is that it assumes that all the < $130/kg uranium is in the current RAR+IR and that anything beyond this will cost more. This is simply not he case. I do not assume that all the < $130/kg uranium is in RAR+IR. I take this two reserve categories, and see by what factor do reserves increase with increasing price. Your including all categories gives you 4.35. So 4.35/3.25 is a factor of 1.34, greater than one but still very low. Of course, most >$130/kg resources should be in the "Undiscovered Speculative" reserve category so you certainly have a point there. But there we go back again to the "we need better reserve estimates". Where is that price? How much can we expand our reserves by rising the price we are willing to pay for them? Thus to make meaningful predictions we need to know how big reserves would be in the greater than 130$/kgU region. I somehow failed to read in this article where estimates of these reserves were made. The problem is that if they wait for MOX to be economic before they introduce it mass-scale, uranium will be depleted too fast and nuclear power could have already become too expensive. Right, the overnight cliff. I don't buy it. And this conclusion is made despite the fact theres no solid estimate for the reserves at various price points. It also ignores reprocessing being a fuel multiplier. This statement is sloppy. Most breeders aren't made to breed fuel for other reactors but to close the nuclear fuel cycle and the notion of them providing a 'breeding contribution' is a bit confusing. It presupposes that in 30 years we'll even need breeders, and theres nothing in the entire article to support that. I find the entire article sloppy and unconvincing, with unsupported conclusions and a rambling thesis. In order to meaningfully post comments, you first need to actually read and then comprehend the main story. Come on, after seeing those $c/kwh numbers you really think that there are uranium reserves for thousands of years in the case of an increased nuclear capacity?. You used to justify that with uranium prices of thousands of dollars. Even in the best case you won't find enough reserves below $1000 to last thousands of years. Not even with reprocessing. LOL. Always this attacks. What's the matter with you?. It seems that you will never find anything convincing if it doesn't paint our nuclear future in the best possible light, will you? You used to justify that with uranium prices of thousands of dollars. Even in the best case you won't find enough reserves below $1000 to last thousands of years. Not even with reprocessing. With reprocessing you dont need it below $1000 dollars. Its a resource multiplier. Extra enrichment stages are also resource multipliers. No, I just find it unconvincing when people are just plain wrong. That is the point: they have not been made. I made a calculation that shows that nuclear energy becomes uncompetitive at an uranium price below $1000/kgU (exactly how much will depend on alternatives at that time). Now we need reserve estimates that show how much recoverable uranium there is at different price points between $130 and $1000, we cut at some chosen too expensive price ($600? $800?) and voilà, we can predict how long uranium reserves would last at a given nuclear capacity. It is not a cliff. It goes like this: currently no one apart from France does any significant reprocessing because it adds up to the final electricity production costs (The added costs wouldn't be extremely high, mind you, nuclear electricity would still cost less than c6/kwh). The world in general waits for uranium prices to climb to levels that allow reprocessing to reach break-even (that means it doesn't add to the final cost, and then it even becomes profitable). If that uranium price level is the $400/kgU stated in the US House report (but it is considered optimistic), and preparations begin with foresight before uranium reserves at that price level have to be extracted, reprocessing would begin it's multiplying effect at a price level of $400/kgU. Reserves are multiplied by 3 by reprocessing, but we are now in expensive territory, and starting at $400/kgU uranium will quickly become too expensive even if reserves above that level are trebled. So yes, reprocessing could extend uranium reserves life greatly, but because the decision to implement such a program has been left to the market, it will come late and will have much less of an impact. In an scenario where nuclear capacity is increased, even in the best case (abundant $130-$1000 reserves) there wouldn't be enough uranium for thousands of years. Do the numbers. Bear in mind I am not requiring the nuclear industry to prove that uranium will last that long. That would be absurd. I am just saying that statements like "uranium contributes so little to total costs that we could use $10,000 uranium so we have thousands of years worth of reserves" are not realistic. I have addressed reprocessing above. It presupposes that in 30 years we'll even need breeders, and theres nothing in the entire article to support that. "Breeders would thus not be able to significantly contribute to an hypothetical aggressive 5 or 10 fold increase in nuclear capacity over the next 30 year". No, I didn't say that we need breeders in the next 30 years. But IF an aggressive five-fold nuclear energy expansion is carried out, uranium consumption in 30 years would be stupendous. Without a significant contribution from breeders before then, most of the cheap and easy uranium would be gone. To explain that the graph (Figure 4) is erroneous, you would have to admit that a part of the nuclear industry (generation IV research) is lying. Last, you are free to say what you like, even "ramblings" as you say I do, and also encouraged to point out any flaws in my arguments, but you don't need to attack me every time you reply. If that uranium price level is the $400/kgU stated in the US House report (but it is considered optimistic), and preparations begin with foresight before uranium reserves at that price level have to be extracted, reprocessing would begin it's multiplying effect at a price level of $400/kgU. Reserves are multiplied by 3 by reprocessing, but we are now in expensive territory, and starting at $400/kgU uranium will quickly become too expensive even if reserves above that level are trebled. Start over. Your argument doesnt make sense. So the price climbs to $400/kg and then reprocessing becomes competitive and you have 3 times the resources (at least.) Then what? How will it be too late? We'll have many decades of spent fuel to process at the very least. What numbers do you want to use? You can have uranium at over 20 times the current price because you can get 2-3 times as much energy out just by using extra enrichment (or CANDU reactors) and another 3 times as much from reprocessing. I dont expect we're going to be tapping out ores of $2000 lb uranium anytime soon; Gold after all can be economically recovered from ore grades as low as .5ppm, and its reasonable to expect that uranium ores of 20ppm wouldn't be more than 1/10th the price to exploit. No, you havent. You said too little too late with no illumination. Without a significant contribution from breeders before then, most of the cheap and easy uranium would be gone. That was never demonstrated anywhere. There is a lot of reprocessing being done. More in the UK according to wikipedia. Japan will be reprocessing at about half of the French rate this year. The Russians have an operating 560MW fast breeder and will complete an 800MW fast breeder in 2012-2015. The Russians want to capture a lot of the nuclear reactor construction business and seem willing to build FBR for China, Japan and others. France's plutonium is shipped to the 120 t/yr Melox plant at Marcoule for prompt fabrication into mixed-oxide (MOX) fuel, which can be used in about 30 reactors in Europe. Japan had a pilot reprocessing of 90/t year and this year starts up the 800t/year plant. Japan has 6400 tonnes of uranium recovered from reprocessing and stored in France and the UK, where the reprocessing was carried out. In 2007 it was agreed that Russia's Atomenergoprom would enrich this for the Japanse utilities who own it. At Tokai-mura, in Ibaraki prefecture north of Tokyo, Mitsubishi Nuclear Fuel Co Ltd operates a major fuel fabrication facility, which started up in 1972. Further fuel fabrication plants are operated by Nuclear Fuel Industries (NFI) in Tokai and Kumatori, and JAEA has some experimental mixed oxide (MOX) fuel facilities at Tokai for both the Fugen ATR and the FBR program, with capacity about 10 t/yr for each. Also at Tokai, JNC (now JAEA) has operated a 90 t/yr pilot reprocessing plant which has treated 1116 tonnes of used fuel between 1977 and its final batch early in 2006. It will now focus on R&D, including reprocessing of MOX fuel. JAEA operates spent fuel storage facilities there and is proposing a further one. It has also operated a pilot high-level waste (HLW) vitrification plant at Tokai since 1995. Tokai is the main site of JAEA's R&D on HLW treatment and disposal. Japan is in the final commissioning and commercial operation of JNFL's Rokkasho-mura reprocessing plant. Some 430 tonnes of used fuel will be put through the plant to test all aspects of its operation. JNFL has applied for a licence to build and operate the 130 t/yr MOX plant. Construction of the US$ 1.2 billion plant is expected to begin in 2007 with operation about 2012. The Rokkasha Maru 800 t/yr reprocessing plant will go into full production this year. The Russians have a functioning FBR of 560 MW. Beloyarsk 3. The BN-800 Beloyarsk-4 fast reactor designed by OKBM is intended to replace the BN-600 unit 3 and the US$ 1.22 billion project may become international, with Japanese and Chinese involvement. Construction has been delayed by lack of funds, but as of mid 2006 the project is expected to resume with adequate funding (of US$ 2.12 billion) for 2012 start-up. The construction funds include $280 million in 2008 and $500 million in each of 2009 and 2010. The BN-800 fast neutron reactor being built by OKBM at Beloyarsk is designed to supersede the BN-600 unit there and utilise MOX fuel with both reactor-grade and weapons plutonium. Further BN-800 units are planned and a BN-1800 is being designed for operation from 2020. This represents a technological advantage for Russia and has significant export or collaborative potential with Japan. Russia is plan and goal is to get 25-30% of the global nuclear power plant construction business. Russia has the Mayak 400 t/yr RT-1 plant at Ozersk (Chelyabinsk-65) in the Urals. China has a pilot (50 t/yr) reprocessing plant using the Purex process was opened in 2006 at Lanzhou or Jiayuguan. This is capable of expansion to 100 t/yr and will be fully operational in 2008. A large commercial reprocessing plant based on indigenous advanced technology is planned to follow and begin operation about 2020. Breeders 'burn' u-238. This 99.3% of Uranium ore IS the 'cheap and easy' part, the part we spend loads of energy trying to remove to purify the fuel. It's considered nuclear waste that the US government would really like to give away to anyone that thinks they can use it, since burial would be so expensive. We have literally a billion pounds of the stuff sitting in depots. We're willing to pack this radioactive material into our tank and planes in order to not have to pay slightly more to put Asian-mined tungsten into munitions whose only design purpose was penetrating the T-72 main battle tank. We're that desperate to if not get rid of it, at least manage the stockpiles. That stuff isn't going to disappear if we spend 30 years burning U-235 as fast as we can. It's going to pile up higher and higher. Can we just increase the reserves cap to 1,000$/kgU or 10,000$/kgU and be awash in uranium? Is uranium economically recoverable at any ore grade, at any price, even from granite as they claim? Or fossil. His insinuation will certainly be pleasing to those of his readers whose financial maintenance largely depends on fossil fuel tax revenues, for these typically are in the $1,000-to-$10,000 range, per kgU-equivalent, today. proportionally, as the skin of an apple. This 0.00025-mass-percent concentration nearest our feet is extremely abundant in two ways: compared to rocks that have not benefited from Earth's billions of years of bubble-up, aka differentiation history, and compared to fossil fuel ores such as the Alberta tarsands, which yield about the same heat if their tar is burned as country rock does if its U is passed once through a CANDU. It is as if tarsands covered every continent miles deep. What might prompt one to believe or disbelieve that an enormous amount of uranium, in the range from one-tenth of a percent to one percent of that 35 trillion tonnes, can be extracted with little environmental harm over the next, say 10,000 years? With the mentioned once-through CANDU usage this would translate into 20-to-200 terawatts, electric, for that long. I don't think one needs to be very firm about that; it is enough to note that recent years' trend has been that five tonnes of economically mineable U are discovered for every one tonne that goes once through today's plants. Torres addresses the large additional amount of uranium reserves that the IAEA estimates as "Prognosticated Undiscovered Resources" in a particular year's report, but doesn't acknowledge the increase in reasonably assured resources, as estimated by the same authority, that has been occurring between years. haul can then be seen as our assurance that this trend of discovery outpacing use, if it changes, will not change quickly. Unless the price comes down, of course. bridge'. Building that clean super-grid will require enormous energy input using high yield sources near term. Apart from transport electrification I think we'll also need more capital intensive hydroponic and glasshouse farming as the climate gets weirder. Alas I think it will become apparent the world has too many people for that energy capital to go round. Put the spent nuclear fuel down deep boreholes so later generations can't get to it. If done right nuclear could be a lucky one-off chance to create a long term sustainable system. The article is suggesting 'forget nuclear'. That is not true. It doesn't say nuclear is great or bad. It just tries to discern how big nuclear capacity can be based on uranium availability alone as a limiting factor. The first is that there is enough uranium for the whole century at current or slightly increased nuclear capacity (that is certainly not 'forget nuclear'). The second is that you can not increase nuclear capacity indefinitely. 10 times current capacity would quickly make uranium very, very expensive. And I show how expensive uranium affects final price. Third, it addresses how reprocessing and breeders do not automatically render the uranium question a non-issue. Forth, that to reach any meaningful conclusion of how much you can expand nuclear energy at a reasonable cost, we need much, much better and expanded reserve estimates. How you conclude that "The article is suggesting 'forget nuclear'", I do not know. I guess nuclear energy discussions have a tendency to polarize too much. It seems to me that the best long range reliable solution is concentrated solar thermal. In India they cook chickens in a copper parabolic reflector. Solar trough collectors can be made with hardware store components. Second world technology. Maybe that's the problem. Too simple. Any decent engineer can make one. Plus the best available locations aren't where 'we' live. Doesn't help much in New York in January. No good. Nice to see that the more enlightened Europeans are contemplating a grid to produce solar electricity in North Africa and send it north. Maybe George and co can strike a deal with the Mexicans to generate power as part of NAFTA. Better bet long range than tortilla ethanol. Yes, the problem is not really technical. And nuclear is a diversion - a dangerous, complex, and ultimately doomed one - including fusion. C'mon folks; we have a monstrous fusion reactor that comes up every morning on a reliable basis. Let's just get on with it, NOW. Concentrate. a dangerous, complex, and ultimately doomed one -including fusion. I stand by everything I said. We already have a fusion reactor. It's also at a respectable distance, long lasting, no maintenance and accessible to everyone. Perhaps what is lacking is system of 'mineral rights' to tax access to solar exploitation - now that's a jest, or black humor. Wall Street can't deal with, literally, anything that is free and universal. The planet is fine, and humanity is in pretty good shape by historical standards, but unless politics , religion, and economics can get a handle on the changes we face, we are in for a rough ride. Once we look at oil depletion as a solution instead of a problem, we'll be much better off. It all reminds me of Butch Cassidy saying, "If he'd only pay me what it costs him to get me to stop robbin' him, I'd stop robbin him." How many BOE of solar capacity does a seemingly perpetual war with enduring bases buy? From a future perspective, the ever diminishing oil left in the ground isn't worth the effort to coax it out. It never was a good long term investment. Lets move on. Maybe that's the problem. Too simple. Any decent engineer can make one. Plus the best available locations aren't where 'we' live. Given that solar is apparently so simple (thermal solar with concentrators conceivably could have been done in 1925 boiling water to steam), easy and cheap, and really without strong side-effects, then why over decades is it so miniscule in use? There isn't any patent restrictions on the basic designs either. That says something to me: the fundamental physics is not in favor. There just isn't enough concentrated low-entropy energy in sufficient density to make it work desriably. When you do thermodynamics what matters is concentration of energy over a large temperature gradient. This is why large nuclear plants still win, the raw numbers of useful work produced is so large. If there was any doubt that increased price spurs increased exploration activity, just have a look at an industry web site. Lots of rah-rah hype but there really are a lot of companies looking for and finding Uranium. $1300 per kilogram is approximately three times the price of currently mined silver, which has an elemental abundance 30 times smaller than Uranium, is currently produced at a rate of 174,000 tonnes per annum (almost 3 times the total demand for nuclear power). Note that silver has been mined for well over 2000 years, Uranium mining only started post-1940. I think it unlikely that Uranium will be that expensive at the of the century. Uranium from seawater and Fast-breeders provide a lay-down mazaire for Nuclear Fission over the very long term. Light water reactors can scale to meet whatever demand eventuates for Nuclear Power for the next century at least. The Uraniumminer site seems a little flaky. Very forward looking, it seems like a small cap or even micro cap stock pumper site. Seems like they do not know the world is running out of oil. Some oil companies have been selling their refineries. The buyers were not sure the world was running out of oil. The world is slowly running out of oil. It might go down more quickly with a proliferation of BMW's and heavy vehicles built to sustain impact at high speeds while sacrificing gasoline/mileage economy. Yeah. I agree the purpose of the uraniumminer site is to promote small cap stocks. There are lots of press releases though and there is some information in the noise. Whoops! I was off by an order of magnitude in translating annual silver production of 600 million ounces to tonnes. The right number is 16,000 tonnes of annual production which is about one quarter of current Uranium demand. Still if we scale with crustal abundance (30 times more Uranium), a price $400 per kg implies an annual rate of 480,000 tonnes of Uranium, 8 times current demand. I've pointed this out before - these figures for metal content of the earth's crust are guesses based on small disorganized samplings and therefore not trustworthy. As far as obtaining it from the oceans - don't be daft. A plant would have to use enormous volumes of 'new' water and that would require enormous amounts of energy to move that water [based on the description of the process above]. 'New' - not the same as before. Hope was the last ill to escape Pandora's box. I've pointed this out before - these figures for metal content of the earth's crust are guesses based on small disorganized samplings and therefore not trustworthy. My concern with nuclear remains: it requires an infrastructure that is entirely dependent on our modern industry and technology. That base is not guaranteed to continue being available on the down side of of peak oil and gas. What I would love to see is an analysis that examines just how just how great that dependence is. How much of our modern industrial and technology base is needed to keep the nuclear reactors in business, indeed expand them greatly? This is a big decision. If it is made incorrectly, we risk bequeathing posterity a technology they will not have the resources to deal with, even to shut it down safely. Cuba and North Korea provide an interesting contrast in dealing with resource collapse. North Korea has continued producing missles, nuclear weapons, etc. but at a very great cost to its population. Cuba, on the other hand, after the collapse of the Soviet Union, has done lot of low tech stuff, especially in agriculture. Low tech is not the right word -- not capital intensive is better. Dale Allen Pfeiffer wrote a little book, Eating Fossil Fuels, that deals with some of this. Me too. I would also like to know where the extra energy needed to switch from our present established carbon run civilization to one of wind, solar etc., as well as the new grid needed, will come from. Just curious, also am curious how to make tallow candles but only when depressed. and the darker the attic the more comes the bats. Why? The recent price spikes of uranium show that nuclear power is relatively insensitive to price swings and can outbid other sectors for critical fossil resources in the short run and convert to substitutes smoothly in the long run. This assumes decline in civilization resources to the point that we cant afford electric power; I find that a tad ludicrous. Cuba and North Korea provide an interesting contrast in dealing with resource collapse. North Korea has continued producing missles, nuclear weapons, etc. but at a very great cost to its population. Cuba, on the other hand, after the collapse of the Soviet Union, has done lot of low tech stuff, especially in agriculture. Low tech is not the right word -- not capital intensive is better. Both are inefficient command economies that started with rather low resources to begin with. And the Cuban power grid is almost exclusively powered by - oil. Contrary to popular opinion, Cuba is probably one of the least peak oil adapted countries in the world. At least if you'd like to have electricity post peak. So, I take it from this discussion that *if* nuclear is to become a major player to offset energy depletion due to peak oil, which I believe would mean an order of magnitude ramp-up over existing / planned installed power, then we better start NOW on Thorium fuel cycles (breed fissile U233 with thermal reactors at least, or molten salt advanced reactors with closed fuel cycle) and fast reactors (breed fissile Pu isotopes from U238). Otherwise, economics of Uranium with existing throw-away fuel cycles will rapidly become untenable economically over the coming decades with any serious nuclear build-out? No, the article never established any resource base exploitable at various price brackets ($10/kg, $100/kg, $1000/kg) and ignores effects of reprocessing and double enrichment as resource multipliers. If we work on thorium fuel cycles or breeders, it will be because they offer significant political/economic benifits over light and heavy water reactors rather than because uranium is facing some shortage. a) It seems that nuclear is a very polarizing issue. I must remember that we get only electricity from nuclear. No gas. No medicinals. No plastics. We have to convert our infrastucture to became all-electric. This take 20 years at best ---> peak oil will strike first. b) It seems that the fossil fuel energy subside is often forgotten. In a Peak oil scenario, you have to consider a rude ramp up of general costs, because almost every aspect (from exploration,to mining,to nuclear plant construction, managing, waste disposal, power plant disposal) is fuelled by CHEAP fossil energy. But fossil energy will not be cheap anymore in the future.This is the reason because not only EROEI, but also Energy Quality Mix must be used to validate a energy resource. c) Considering the temporal landscape , considering that Peak oil is somewhere between last year and 2018, considering the Hirsch report and like, it seems that the economic hardships that are waiting us will select the best energy source for us. May be not the best. I 'd say, the best positioned at the moment. In my opinion it would depend on the desire to proceed rather than any engineering or production problems. If there is no political will there will be no redirection of production. If our 'civilization' prefers it's toys rather than keeping the lights on, that will be the deciding factor for nuclear or wind or whatever, not the ability to proceed in an orderly and timely fashion. As a side issue; after a Peak Oil slide, where a point of energy in equaling energy out, is reached, I imagine it will still be possible to use some of the remaining oil/gas in the production of 'plastics', they will just be more expensive. 'Plastics ' are not used as energy and would have a different cost related viability of production factor. As an instance, when would glass produced in electric kilns be less expensive than using plastic in the production of containers? The more pertinent point being made was along the lines of: each nuclear facility costs somewhere in the region of $3-4 billion for construction, site clean-up and short term storage costs (assuming no cost overruns). In order to make nuclear a major contender in the electricity market in the US by 2025 you would need a 5-10 fold increase in plants (depending on increased demand - and switching over to a highly electric economy may require an even greater ramp up). This means 500-1000 new plants. $1.5-4 trillion. In a post peak work construction costs will escalate as fossil fuel becomes more expensive. Perhaps many large projects will be abandoned as investors pull out... Where will the money come from to meet escalating costs in a squandering economy? Does a large ramp up seem likely from an economic point of view? Nuclear energy requires a very high investment (infrastructure, research) and a very high upkeep (skilled personnel, waste management) both in the foreseeable (no problem) but also the unforeseeable future. I think that investments in research will have a better payoff when concentrated on solar and wind. Their upkeep and installation costs can be as high per unit output, but it is a dispersed burden and therefore easier to bear. More importantly, if you can't repair a windmill, it just stands there and rusts a bit until someone salvages the metal. Don't try that with a nuclear plant or nuclear waste. No matter how small the risk, it's unnecessary risk. Regarding the issue of storage: nuclear isn't flexible either, so we will have to invest in energy storage facilities anyway, what kind of energy source we use. No way around it. Rubbish! I am surprised to see such fundamental misunderstanding on a technically competent forum. The normal uranium based fast breeder reactors are fuelled by U238 which is consumed as the electricity is generated. The U238 is consumed in a two stage process. In the second step the plutonium is recovered and formed into fuel elements and placed in the centre of the reactor where it undergoes fission by means of fast (unmoderated) neutrons. This is an energy producing reaction and produces enough energy to run the first step and have extra energy left to generate electricity by thermalisation and the conventional steam cycle. Such reactors can accept natural uranium where the 0.7% of U235 provides a small beneficial side reaction, or can use the huge existing stockpiles of depleted uranium produced as waste by uranium enrichment for thermal reactors. It can also use the plutonium that is now excess to military requirements. By this means it greatly extents the amount of electricity that can be produced by whatever uranium there is, perhaps by a factor of 200 which will be a very long time but it could not "theoretically forever solve the uranium supply problem"
Rubbish! I am surprised to see such fundamental misunderstanding on a technically competent forum. Aha. Good day to you too. I fail to see how your explanation is different from what I wrote. If we agree that there is enough uranium for at least this century at current capacity for the once-through cycle, 100 years times your 200 times extension means 20,000 years. If we expand nuclear capacity by a factor of 10, it still gives us 2,000+ years worth of uranium reserves. I think anyone would call that "solve the uranium supply problem forever". You are only nitpicking. Yes, my description of breeders was an oversimplification, but it was not the main theme and I cannot post a 10,000 words article on the Oil Drum. I hope you can understand that. I fail to see how your explanation is different from what I wrote. You say it is a fully closed cycle. I say it is fuelled by uranium which has to be mined. your explanation was not oversimplified it was wrong. I object because even if you understood the true nature of breeder reactors, there are many I have met that, having heard tales of them "making their own fuel", believe that they somehow contravene the first law of thermodynamics. Posting such words on a forum that has some reputation for technical accuracy will spread this misconception. You did not need a 10,000 word article. All you needed to say was that by allowing 100% of natural uranium to be used as fuel rather than the 0.7% that is U235 (or the 0.5% that is normally recovered by enrichment) fast breeder reactors extend our nuclear fuel by that ratio. There were more than 6 billion pounds of uranium thought to be recoverable at a price of $65. per pound of uranium. The current spot price is $113. per pound (KITCO). There may be 34 years of uranium at $65. per pound and constant usage of 175 million pounds per year. This usage was projected to grow to 260 million pounds per year in 2025 - WNA. It takes up to ten years to build a nuclear plant, ten years to open a major mine. The conversion to nuclear power is a gradual process. Nuclear power remains one of the least expensive means of generating power. Europe and North America have also been considering the addition of new reactors. At prices below $500 per pound for uranium the cost advantage of nuclear energy disappeared when compared to the more cost efficient mine mouth coal-electric generation. Hydroelectric dams had lower operating costs than nuclear or coal fired power. Fast breeder reactors are not likely very popular in the world. That article is from 2001. The BN800 was funded again in 2006 and foundations have been poured. Russia's financial situation is fairly good again (thanks to oil and resource money). Here is a European study of reactors. Pages 40-48 discuss the Renaissance of the Fast Sodium reactor. India has a 1200MWth fast breeder which began construction in 2004 and should be done in 2010. It is first in a series of 3 identical reactos. China has a 75 MWth FBR under construction scheduled for divergence in 2010. I don't understand how U can be extracted from water, by polyethylene! Are you sure no reactive groups have been grafted on? A Chelating group I suppose, otherwise unsticking it will be difficult. Polyethylene fiber is given a chemical structure of high affinity to uranium in seawater by radiation-induced graft polymerization. Apparently "graft polymerization" involves (in this case) addition of another reactive group. The adsorbed uranium on the adsorbent was collected by elution with acid solution. That's good news, since it means the adsorbent can be reused: they quote currently 18 uses for a 4 ppk adsorbent (they don't state what the limit on uses comes from). They hope to get 6ppk with 20 uses, or a total of 0.12 (?? see below) kg U per kg adsorbent over a 3.3 year useful life (60 days * 20 uses). It is not clear to me whether the 6 ppk is the initial (maximum) efficacy or the average - I would expect it to drop over the lifetime. The above calculation uses it as though it were the average. Also, the remarks above on fabrication ability concentrated on the polyethylene substrate: the grafted units, even if they are a small mass fraction, probably comprise a substantial fraction of the total effort (polyethylene is particularly easy to synthesize and already benefits from economies of scale). Too much thinking about what nuclear power is seems narrow minded on both sides. Just because PWRs are big has more to do with labor costs than anything inherent in the design. US Navy reactors are much smaller than nuke powerplants because they don't pay the operating technicians that much. Since it doesn't take 10 times as many people to operate a 2,000 MW plant than a 200 MW plant it makes economic sense to make them as big as possible. There are forms of nuke power which require no people to reliably and safely operate for decades. They are used on deep space probes. It is just a thermopile wrapped around a hot piece of plutonium. Not very efficient but the fuel is very cheap on a per kwh basis. As the above article states about 2 kwh to the penny. I'd love to have one buried in my backyard providing heat and electricity to my home and vehicles. Then there is the betavoltaic possibility. Using ultracap manufacturing techniques very large surface areas of PV material can be squeezed into relatively small spaces. Powered by potassium 40 (the most abundant radioactive isotope on earth) electricity can be generated for a few decades from a small box. Small constant output generators that could be built into the devices that use them thereby eliminating the need for the grid.